Sea Market, Trammel, Chesapeake (PaxLair Times) – May 18, 2011 – by Ashlynn – Alone I should add, and a few days ago too, though it is a venture he partakes in often so I am told. I was along to watch him hunt corsairs with nothing but his tillerman, a bow and one foot upon the prow culverin. As I wouldn’t be doing a great deal of anything while I watched him sink a few Orcish vessels, I set up a small bench on the deck of the ship. Captain Robin had a simple strategy – approach the enemy head on then stay just within bow range while occasionally firing the front cannon. I had an even simpler strategy – hide. It was more of a pleasure cruise for me. I had no cider though! Much to our dismay, we had to withdraw from the first engagement with the pirates. 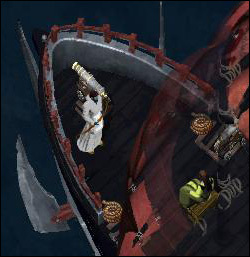 Though many of the ship’s crew fell to Robin’s arrows, the ship itself seemed to have an iron hull and the cannonshot simply bounced off of it. Fortunately, Captain Robin had instructions to hunt two marks and we quickly found the second nearby. It wasn’t long before most of the crew were dead and the enemy ship was dead in the water. While I boarded to seize the pirate’s stolen cargo, Robin engaged in a lengthy archery duel with the enemy captain and it wasn’t long before he was in irons. Back at sea market (we took a quick detour to the Lost Lands), we turned over the pirate and our reward was gold and… a few magical cannonballs. A little disappointing but the trip was certainly an interesting one! This entry was posted in Other, Player Event, Sea Market. Bookmark the permalink.